Leonard Cohen, speaker; vocalists; instrumental ensemble, conducted by Michael Riesman. Orange Mountain Music OMM0043; CD. A BENEFIT of running your own record company is that you can get your projects out almost before the ink dries. And Philip Glass, who plows through score paper by the ream, clearly doesn't want to fall far behind. His hot work this summer — before "Appomattox," his hot work of the fall — was "Book of Longing," a collaboration with the poet and songwriter Leonard Cohen. A cycle of 22 songs, the work had its premiere in Toronto in June and turned up at Lincoln Center in July. Mr. Cohen's poetry, like his song lyrics, explores his fascination with both spirituality and carnality, his failures as likely an inspiration as his successes. He writes with the same wit he has brought to his songs since the mid-1960s but with greater depth and concision. Off-kilter religiosity is a trademark: many of the poems are deeply rooted in Jewish imagery, but Mr. Cohen's struggle to master Buddhism is a recurring theme as well. In bringing these texts to life Mr. Glass abandons many of his trademark gestures, or draws on them only in passing. Instead he provides graceful, constrained melodies that cling tightly to the texts and sometimes mirror Mr. Cohen's own style: a consequence, perhaps, of the natural cadence that weaves through Mr. Cohen's work. Mr. Glass's most striking contributions often come between the texts, in extended, virtuosic instrumental solos. The instrumentalists play this music exquisitely. The singing, by vocalists drawn mostly from pop, jazz and theater, is purposely unpolished and sounds more rough-hewn and modest on disc than it did in concert. Mr. Cohen's baritonal readings, interspersed through the set, are a highlight. In concert he was heard on tape; here he seems as present (or not) as anyone else, an illusory part of the ensemble rather than a ghost in the machine. Since the poems were highlight for me, I like that the disk makes them feel more like "Cohen live." Still going to miss the artwork, and don't think the cd brochure will be able to get enough, but we'll have to see. Placed my advance Amazon order yesterday for 11/27 release. Leonard and I first began talking about a poetry and music collaboration more than six years ago. We met at that time in Los Angeles, and he had with him a manuscript that became the basis of the collection of poetry now published as the Book of Longing. In the course of an afternoon that stretched into the evening, he read virtually the whole book to me. I found the work intensely beautiful, personal, and inspiring. On the spot, I proposed an evening-length work of poetry, music, and image based on this work. Leonard liked my idea, and we agreed to begin. Now, six years later, our stars are in alignment, the book is published, and I have composed the music. For me, this work is both a departure from past work and a fulfillment of an artistic dream. ..and so have I after hearing clips on Amazon. very intriguing music, almost a challenge....look forward to it. And hopefully it will lead to a fulfilling journey through Philip Glass' music which I had not been familiar with before. p.s. went ahead and ordered Passages too (Philip Glass-Ravi Shankar). check it out on Amazon....sounds very cool! All songs are previewed at http://www.amazon.com/Glass-Book-Longin ... 74&s=music, and it sounds like Cats meet Cohen Verses. We are going to miss Lewis Furey after all. And some people dare to say that Phil Spector missed Cohen's deepness.
. . . and it sounds like Cats meet Cohen Verses. . . . And some people dare to say that Phil Spector missed Cohen's deepness. I listened to all previews, and I think it's ridiculous. Any kind of verses culd be attached to such music. It's typical, first tune which comes t mind when you're doing musical piece in so-called modern classical music. Philip Glass can do much better as he is his own criterium adn made music for Quatsy trilogy and Einstein on the Beach and all that great stuff. The singing is ridiculous. The singing does sound like a Broadway musical. I don't believe that my impression would change when the double CD set arrives, but I will give it a try. Maybe such singing simply doesn't go with Leonard Cohen's texts. And we made laugh of Night Magic. Tom Sakic wrote: The singing is ridiculous. The singing does sound like a Broadway musical. I don't believe that my impression would change when the double CD set arrives, but I will give it a try. Maybe such singing simply doesn't go with Leonard Cohen's texts. And we made laugh of Night Magic. I have seen it twice now. I saw the premiere in Toronto and I also went to the Barbican show. I wanted to see how the show developed. I do not think it is the strongest of Philip Glass's works. I tend to like his instrumental work the most. I too have a problem with the Broadway style of singing. That is not a musical style I enjoy. I think Philip Glass underused the recordings of Leonard Cohen's voice and overused poems that had already been turned into songs. That being said, it was a fascinating experience to hear the words turned into something different and to see all of the drawings up in the background of the staging, especially things that I recognized only from the files! But I am not asking for the CD for Christmas! Even with the visual impression I didn't enjoy that enterprise much. It was acceptable Saturday evening entertainment, especially with the nice hall and knowing that Leonard was around and some friends. I never liked musicals except for Evita. I liked a bit of the instrumental parts and that was it. I don't need this CD. Due to my high-priced, premium seat and ideal vantage point, I still think I may have missed a thing or two . So, I'll need to experience the cd to get a better sense of it all; however, I'm a little confused by the Broadway comparison. I have recordings of a number of Broadway soundtracks and they are all very melodic, very memorable, and very easy to sing along to; and my recollection of the songs in this production is that they weren't any of these. Tom Sakic wrote: Maybe such singing simply doesn't go with Leonard Cohen's texts. I fear you have got it the wrong way round. The problem is not with the music or singing, but with Cohen's texts, which are for the most part banal and forgettable. I am not so sure, I think it's vice versa - Leonard's texts are OK, but Glass' music is banal, and singing doesn't goes with the texts. It's simply two different world. But if the poems are so banal, maybe Glass should stick to somebody else's, and keep composing his own acceptable instrumental music, and leave Cohen to compose his own songs, at which he's much better than Glass in any case. The half of good authorship is in choosing the good text template, so Glass missed it completely. Maybe he should ask Elton John for the poems. Aren't we all missing the point here? I wasn't terribly thrilled by Phillip Glass' composition, but I really didn't expect to be. We are a self-selecting sample. By definition, everyone posting on this forum is an admirer of Leonard's poetry and music. But what I do think is significant about this event (and this CD) is that hopefully it is bringing Leonard's work to a wider audience. 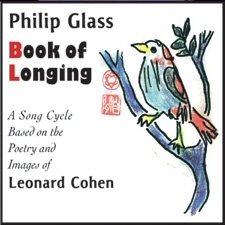 If it encourages Glass fans to explore Leonard's full canon, and even prompts them to buy tickets for Leonard's tour next year, then Book of Longing will have proven to be a resounding success. Let's face it. The thing was never composed for us. I also can't help but recall at the Barbican the two men stated with assurance their intention to collaborate further with Beautiful Losers the source. Nobody makes anybody listen or purchase the material, but every new fan is a plus. Seems to me that no particular good comes from simply disdaining music that one doesn't like. Don't have a way of measuring for sure, but I fear that Glass is probably recognized more universally than Leonard. Therefore, I offer enthusiastic support of the products as good for Leonard's career. Yep, yep, and yep... at the core of things, I agree with both of you. I was thinking/hoping that Glass fans would discover Leonard through this and, if they're drawn to melody, will be supremely surprized when they actually reach Leonard's own presentations, as well as Anjani's.